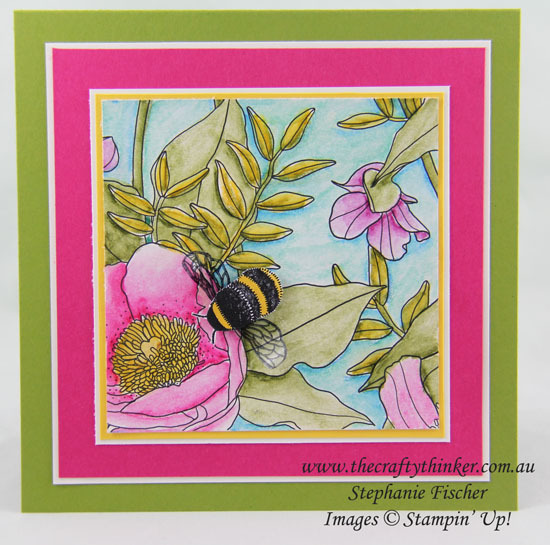 The Crafty Thinker: Stephanie Fischer - Independent Stampin' Up Demonstrator: Bee Colourful Inside The Lines - Sale-A-Bration Sneak Peek! 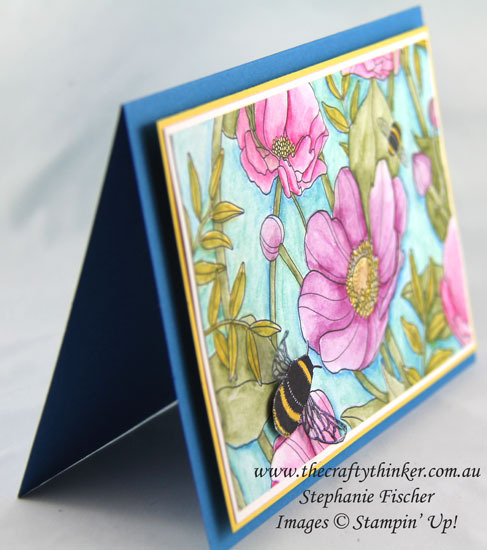 Bee Colourful Inside The Lines - Sale-A-Bration Sneak Peek! I just love this Designer Series Paper! Not just because it's FREE (during Sale-A-Bration with a product order of $90), not just because it's so pretty - it's just so much fun! Colouring in is sooo therapeutic! There are three 12' square sheets each of four designs in the pack and they're black and white - it's up to us to add the colour - if we wish .... it looks great just black and white too! 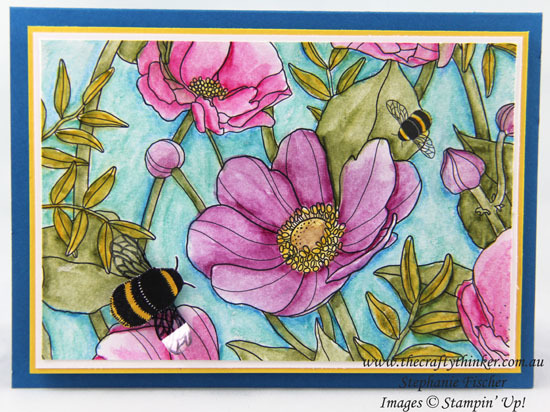 The Stampin' Up Watercolour Pencils are so easy to use! I'd coloured an entire 12" square sheet in no time! I roughly coloured this sheet with the new Stampin' Up Watercolour Pencils and blended with an Aqua Painter. Click here to see the colouring process. The Dragonfly Deams bundle goes with this paper perfectly! It will be available from 4 January in the new Occasions Catalogue. If you were to purchase that bundle plus a pack of Foam Adhesive Strip, the Inside the Lines paper could be yours for FREE (or any other product of your choice from the Sale-A-Bration catalogue)! Not colours I normally use, especially together, but they've created a lovely cheerful, multi-purpose card! 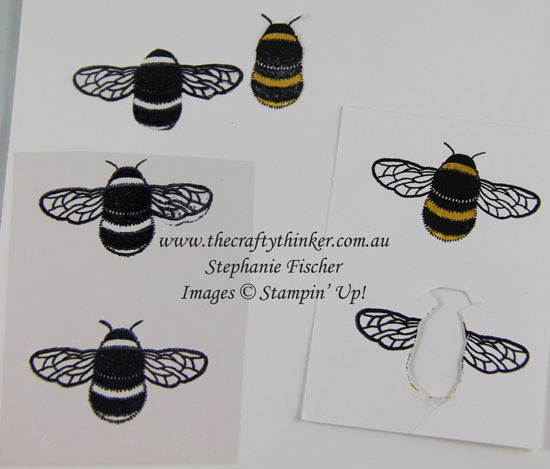 I've included a photo below of the process I used for the gorgeous bumble bee. I stamped the bee once onto Window Sheet using Stazon ink and then cut it out by hand - carefully around the wings and fairly roughly around the body. Then I stamped again onto Whisper White cardstock using Basic Black ink. After colouring in the yellow bits (I used a Watercolour Pencil but any form of colouring is fine), I cut around the body and glued it on top of the wings. I curled up the wings a little by wrapping them around something thin. I happen to have a quilling tool that I used but I would think something like a wooden skewer would work just as well. 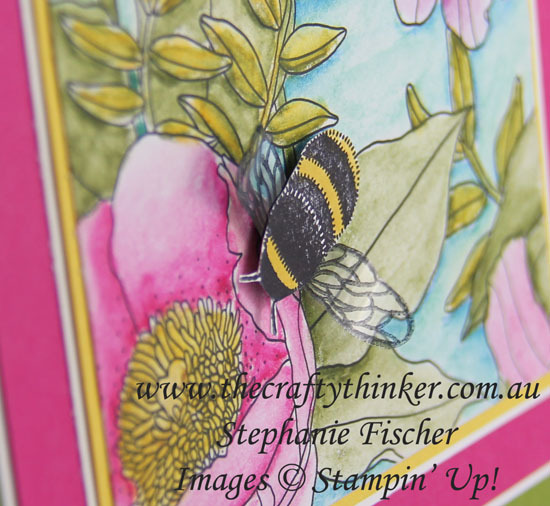 I stuck the bee to the card with some adhesive foam for some depth. Creating a bumble bee with transparent wings. The bee at the top of the image is ready for assembly. Sale-A-Bration runs from 4 January to 31 March - during which time for every $90 of product ordered, you can select one FREE item from the Sale-A-Bration catalogue! To learn how to make the most of Sale-A-Bration visit my Sale-A-Bration page or contact me.